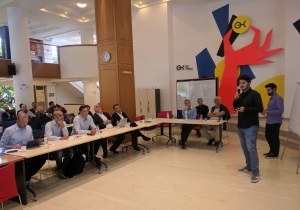 On Monday and Tuesday 22 and 23/10, OK!Thess hosted in its premises the traditional Demo Day, the purpose of which was to enable startups from all over the city to connect with potential investors. Important stakeholders of the local innovation ecosystem responded to the call for the presentation of their best teams to representatives of Venture Capital funds and business angels from Greece and the wider region of Southeastern Europe. OK!Thess, Technology Transfer Office AUTh, Entrepreneurship Hub ACT School of Business, Coho, Thessaloniki Technology Park, Innovation Farm Stage 2. The day began with 8 group presentations in front of 12 representatives of investment funds and continued with individual investor-group meetings, depending on the interest in the product presented. The presentation lasted 10 minutes and aimed at highlighting the key advantages of the solution to attract investor interest for further discussion. FREIGHTS exchange platform - An online platform that allows companies in the transport industry to increase their turnover, develop their network of partners and solve everyday problems quickly and easily, minimizing their costs. HearArtTec - Develops and delivers smart technology solutions for personalized hearing recovery beyond standard headphones. Seamx - Develops an integrated platform for managing sports activities. Casandra - An occupancy prediction service for resorts. Quotelier - A cloud b2b application that allows hotels to manage requests in the best possible way via email, telephone or other conversations, thus increasing their sales. AidPlex - Develops 3D printable plastic splints, customizable for all patients. Proclisis - A software service for small and medium businesses that handle large volumes of complex sales each month. RespiFit - Develops the AsthmaFit product, a portable device system and services that meet the specific needs of patients and provides personalized solutions to track asthma and minimize asthma attacks. On the second day of the Demo Day, less mature groups had individual meetings with business angels and representatives of Venture Capital Funds, aiming not at achieving investment interest but more on feedback for optimizing their solutions. The investors chose the groups they wanted to meet, and in separate meeting spots within the OK!Thess analyzed the business goals of each group, how to use a future funding as well as how they can support the teams themselves with advisory guidance and interconnection with the wider business world.